Sen. Kamala Harris, D-Calif., at an Oakland, Calif., campaign rally this week. Harris says she backs a single-payer health system, but she hasn't yet offered details on how she would finance that plan. 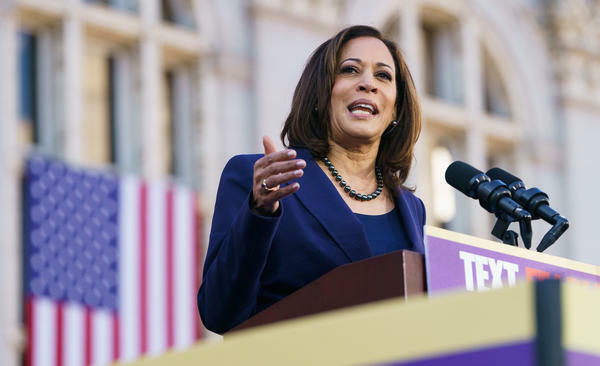 "Who of us has not had that situation, where you've got to wait for approval and the doctor says, well, 'I don't know if your insurance company is going to cover this,' " Harris said. "Let's eliminate all of that. Let's move on." Harris was a co-sponsor of a 2017 bill written by Sen. Bernie Sanders, I-Vt., that would have created a national, single-payer health system, eliminating the private insurance system. Sens. Elizabeth Warren, D-Mass., and Kirsten Gillibrand, D-N.Y., both presidential hopefuls, also co-sponsored the Sanders bill. The major questions the candidates face is how the government would pay for it. Total spending on health care in the U.S. was about $3.5 trillion in 2017 and is forecast to rise to $5.7 trillion in 2026, according to the Department of Health and Human Services. The federal government already pays for a lot of that through Medicare, Medicaid, military health care and the Department of Veterans Affairs. Much of the rest is through employer health insurance plans and individual health insurance and payments by patients. Sanders laid out several options to pay for his proposal, including increasing taxes on employers who would no longer be paying insurance premiums; increasing individual income taxes; and boosting taxes on the wealthy. Harris didn't say, in the town hall-style meeting, how she would pay for the program. And her Senate office didn't respond to an email asking whether she has a funding proposal. Warren has proposed a 2 percent tax on the wealth of an individual that's above $50 million and 3 percent on wealth of more than $1 billion. The mechanism for paying for "Medicare-for-all" can make the politics muddy. A recent poll by the Kaiser Family Foundation suggests that 56 percent of people in the U.S. like the idea overall. But when people heard more details, those numbers changed. When the question included the idea that "Medicare-for-all" would guarantee health insurance as a right, its support rose to 71 percent. But when it said people would have to pay more taxes, the popularity plummeted to 37 percent. That dynamic has created an opening for potential centrist candidates to stake out a middle road. Howard Schultz, the former CEO of Starbucks, who has said he is considering a presidential run, told CBS reporters that Harris' proposal to eliminate the health insurance industry is "not American." He also called proposed tax increases on the wealthy "punitive." Mike Bloomberg, the former mayor of New York and founder of Bloomberg LP, who is also considering a run, said in New Hampshire Tuesday that he, too, opposed the idea. "To replace the entire private system where companies provide health care for their employees would bankrupt us for a very long time," he told workers at a factory he was visiting. Bloomberg has said he supports opening Medicare to people who don't have coverage through their employers. The health insurance industry is already gearing up to oppose any "Medicare-for-all" proposals, according to The Intercept, an investigative news website.